Amherst College is a private liberal arts college in Amherst, Massachusetts. It is the third oldest college in Massachusetts. Established as a men's college, it has been coeducational since 1975. Amherst is a member of the Five Colleges consortium, which allows its students to attend classes at four other Pioneer Valley institutions. These include Mount Holyoke College, Smith College, Hampshire College, and the University of Massachusetts. The Five Colleges are geographically close to one another and are linked by buses which run between the campuses. The Five Colleges share resources and develop common programs. 6.1 Fight song: "Lord Jeffery Amherst"
A small college, Amherst has nonetheless been consistently ranked among the top, and on several occasions as the top, liberal arts college in the United States. It aims to prepare its students for a wide variety of careers, allowing them to develop their unique abilities and talents so that they can best serve society as educated adults. Like many American colleges, Amherst was founded with the goal of preparing young people for lives of religious work. The aims of the school developed to be less parochial over time and today Amherst is known for its excellent liberal arts education. As a small college, Amherst encourages intimate interaction between students and professors. This environment is said to nurture students' abilities rather than intimidate them as nameless, faceless masses. Amherst aims to educate students of all backgrounds in preparation for serving the world in various capacities. "Amherst Academy was the mother of Amherst College," according to William S. Tyler, who wrote two comprehensive histories of Amherst College. Funds were raised for the Academy in 1812, and the school went into operation in December 1814. On November 18, 1817, a project was adopted at the Academy to raise funds for the free instruction of "indigent young men of promising talents and hopeful piety, who shall manifest a desire to obtain a liberal education with a sole view to the Christian ministry." This required a substantial investment from benefactors. During the fundraising for the project, it became clear that without larger designs, it would be impossible to raise sufficient funds. This led the committee overseeing the project to conclude that a new institution should be created. On August 18, 1818, the Amherst Academy board of trustees accepted this conclusion and began building a new college. 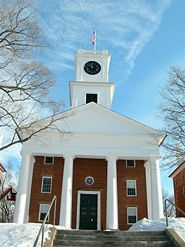 Amherst Academy and Amherst College were both named for the town of Amherst, which in turn was named for Jeffery Amherst, 1st Baron Amherst, commanding general of British forces in North America during the French and Indian War. Lord Amherst is now notorious for his comments, in a letter to a peer, about spreading smallpox-infected blankets among Native Americans. Because the college takes its name from the town, it also inherits the local pronunciation ("am-erst"), in which the "h" is silent. At its opening, Amherst had forty-seven students. Fifteen of these had followed Moore from Williams College. Those fifteen represented about one-third of the whole number at Amherst, and about one-fifth of the whole number in the three classes to which they belonged in Williams College. President Moore died on June 29, 1823, and was replaced with a Williams College trustee, Heman Humphrey. For two years in the mid-1830s, Amherst was the second largest college in the United States, second only to Yale. In 1835, Amherst attempted to create a course of study parallel to the classical liberal arts education. This parallel course focused less on Greek and Latin, instead focusing on English, French, Spanish, chemistry, economics, and so forth. The parallel course did not take hold, however, until the next century. Originally a men's college, Amherst began admitting women in the 1970s. Women were first admitted as transfer students in 1975, while the first entering class were admitted in 1976. Williams alumni are fond of an apocryphal story ascribing the removal of books from the Williams College library to Amherst College, but there is no contemporaneous evidence to verify the story. In 1995, Williams president Harry C. Payne declared the story false, but the legend is still nurtured by many. Academic hoods in the United States are traditionally lined with the official colors of the school, in theory so watchers can tell where the hood wearer earned his or her degree. Amherst's hoods are purple (Williams' official color) with a white stripe or chevron, said to signify that Amherst was born of Williams. 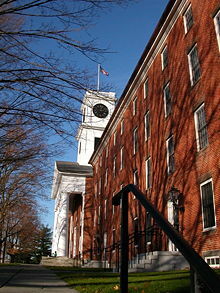 Amherst occupies a 1,000 acre campus in Amherst, Massachusetts. 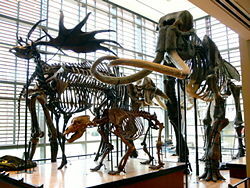 Among the notable resources at Amherst College are the Mead Art Museum, the Amherst Center for Russian Culture, Robert Frost Library, and the Amherst College Museum of Natural History. Amherst maintains a relationship with Doshisha University in Japan, which was founded by Amherst alumnus Joseph Hardy Neesima. In accordance with the will of Amherst alumnus Henry Clay Folger, Amherst College is charged with the governance of the Folger Shakespeare Library in Washington, D.C. Amherst's relationship with the Folger offers various opportunities for students and faculty to study and learn and engage in cultural and arts programs. The Folger, a primary repository of rare materials from the modern period (1500-1750), holds the world's largest collection of the printed works of William Shakespeare, as well as collections of other rare Renaissance books and manuscripts. The Folger is an internationally recognized research library and center for scholarship and learning. The Folger is also an innovator in the preservation of rare materials and an award winning producer of cultural and arts programs, including theater, early music concerts (performed by the Folger Consort), poetry, exhibits, lectures, and family programs. Amherst has a very flexible academic workload. The only course requirement mandated by the registrar is a first-year seminar during the freshman year. Although the Freshman Seminars have similar structures, focusing on critical analysis and development of argument in writing and class discussion, there are usually about sixteen different topics from which to choose. The 31 other courses that must be completed in order to receive a degree from Amherst College can be elected by the individual student. However, students must adhere to departmental course requirements to complete their major. Students can study in 33 different fields and choose from 800 classes. Amherst is a member of the Five Colleges consortium, which allows its students to attend classes at four other Pioneer Valley institutions. These include Mount Holyoke College, Smith College, Hampshire College, and the University of Massachusetts. In addition to the 850 courses available on campus, Amherst students have an additional 6,000 classes to consider through the consortium (without paying additional tuition) and access to 8 million library volumes. The Five Colleges are geographically close to one another and are linked by buses which run between the campuses. The Five Colleges share resources and develop common programs, including the Museums10 program. The Consortium has two joint academic departments, Astronomy and Dance. The Dance department is one of the largest in the nation. The Astronomy department is internationally renowned. The Pioneer Valley schools' proximity to Amherst adds to its rich extracurricular and social life. Nicknamed "the singing college," Amherst has many a Capella and singing groups, some of them affiliated with the college music department, including the Concert Choir, the Madrigal Singers, the Women's Chorus, and the Glee Club, which is the oldest singing group on the campus. Some of the a Capella groups are the Zumbyes, the Bluestockings, Route 9, the Sabrinas, the DQ, and Terras Irradient (the co-ed Christian Acapella group). Amherst's symphony orchestra with more than 70 members and no hired professional musicians is the only one of its size among national liberal art's colleges. A variety of other instrumental groups also rehearse and perform regularly and include: Javanese gamelan, chamber music, South Indian, and jazz. 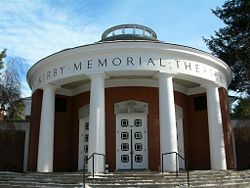 The Amherst College Ames Music Center has 25 listening and practice rooms (thirteen of which are equipped with pianos), an electronic and recording music studio, separate rehearsal space for instrumental and vocal groups, classrooms, a library, and a 500-seat recital hall that serves during the year as a performance venue for students and visiting artists. The school participates in the NCAA's Division III, the Eastern College Athletic Conference, and the New England Small College Athletic Conference, which includes Bates, Bowdoin, Colby, Connecticut College, Hamilton, Middlebury, Trinity, Tufts, Wesleyan, and Williams. Amherst is also one of the "Little Three," along with Williams and Wesleyan. This rivalry, over one hundred years old, can be considered the oldest athletic conference in the nation. A Little Three champion is informally recognized by most teams based on the head-to-head records of the three schools, but three-way competitions are held in some of the sports. The first intercollegiate basketball game was played between Williams and Amherst on July 1, 1859. Amherst won, 73-32. Fight song: "Lord Jeffery Amherst"
Amherst has graduated many notable people including Nobel Prize winners Henry Kendall (Physics), Edmund Phelps (Economics), Harold Varmus (Medicine), and Joseph Stiglitz (Economics). Pulitzer Prize winning alumni are Richard Wilbur, James Merrill, Blair Kamin, Richard Read, and Debby Applegate. Other famous alumni include preacher Henry Ward Beecher, businessman Clarence Birdseye, actor Burgess Meredith, and author of the Da Vinci Code, Dan Brown. ↑ Amherst College, Amherst's Philosophy. Retrieved December 13, 2007. ↑ W. S. Tyler, History of Amherst College during its first half century, 1821-1871 (Springfield, MA: C.W. Bryan, 1873). Tyler, W.S. 1873. History of Amherst College During its First Half Century, 1821-1871. Springfield, MA: C.W.Bryan. The Indicator - Amherst College's Journal of Social and Political Thought. Tyler, William S. 1894. A History of Amherst College. Exercises at the Semi-Centennial of Amherst College. This page was last modified on 14 March 2016, at 15:26.